Guys. I’m excited. About these truffles. These Healthy Chocolate Fudge Truffles… REALLY EXCITED, GAHHHH! So, in case you didn’t guess, I’m pretty pumped about this recipe. So pumped that I somehow forgot to mention that these are just 50 calories a piece. 5-ingredient 50-calorie Chocolate Fudge Truffles! No, you’re not dreaming. Yes, this is real life. The FUDGE factor, people. I can barely handle it. 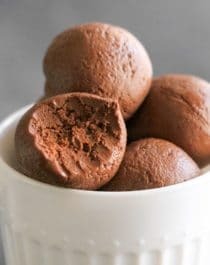 These 50-calorie Healthy Chocolate Fudge Truffles taste like heaven in a bite-sized package! They’re so sweet, chocolatey, and fudgy, you'd never be able to tell they’re low calorie, low carb, sugar free, high protein, dairy free, AND vegan! In a large bowl, whisk together the condensed milk and stevia extract. Add in the protein powder, cocoa powder, and salt. Whisk together until completely combined (mixture should thicken like frosting). Cover and refrigerate the mixture for 5+ hours (mixture should firm up). Use a cookie scoop (for the food service peeps, I used the #40 1½ tbs purple disher) to portion the fudge onto the cookie sheet. Refrigerate uncovered for 30 minutes to an hour. Roll the scoops between your palms to form balls, then place back in the fridge for another 30 minutes to an hour. Serve and enjoy! Try the Ferrero Rochers variation of this recipe! Feel free to coat the truffles in cocoa powder, shredded coconut, mini chocolate chips, natural rainbow sprinkles, or whatever you want! I liked how the chocolate chips added a nice crunch to contrast the smooth and creamy fudge. But then again, the sprinkles were good too… because, well, what is life without sprinkles? While these truffles were good and I’m pretty sure I inhaled them in 2 days, I felt they could have been better. That’s why I revamped the recipe! Each amazing-to-all-that-is-good chocolate fudge truffle has only 50 calories and 2.5g fat, along with 6g of protein! Hi, um, yes. I’ll take seven of these to go, thanks. You only live once soooo… eat to your heart’s content. This is chocolate nirvana. So if you are craving chocolate (WAIT, what kind of question is that? Of course you’re craving chocolate) then make these Chocolate Fudge Truffles. They’re super chocolatey, seriously decadent, and totally guilt-free! These look incredible! I’m not a huge fan of yogurt–does it taste like yogurt or do the other ingredients mask it? Is there something I can substitute for the vanilla paste? Would plain vanilla extract work? I hope you like the truffles!! I’m sorry for the wait, but it’ll be so worth it once you see the post! 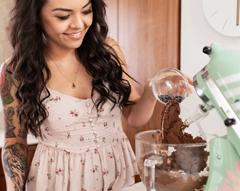 What a delicious and surprisingly healthy chocolate recipe! I am a serious chocolate lover so you can consider that I will be recreating these truffles.. thanks for the recipe. is protein powder a must or can I sub it? I don’t have protein powder. I’m afraid the protein powder is an important ingredient in this recipe. It adds flavor and helps thicken up the truffle “dough” … without it, it will probably be more like a pudding. Would a brown rice flour work? I only use whey protein powder but found brown ride flour. I know I’m not getting the same protein ? But I’m super anxious to try this recipe! Brown rice flour and brown rice protein powder are very different, so the flour won’t work here. Sorry! Would plant based protein powder, like Vega work? 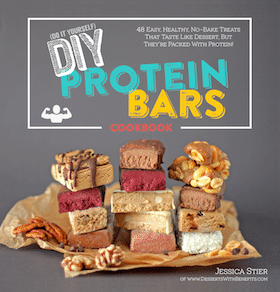 The recipe uses plant based protein already (brown rice protein powder). In my experience, Vega’s protein powder absorbs SO much liquid, that I doubt it would work here without making some other adjustments. I think some crushed nuts would also make a delicious coating…maybe add some pb2 and then crushed peanuts…whoa, I just blew my own mind. Humm, looks taste. I would like to prepare apiece of this one. Hmmm, I haven’t tried freezing these before! Everything keeps for quite some time in the freezer, but just to be safe, I’d say ~3 months in the freezer? Whey/casein doesn’t absorb as much liquid as brown rice protein powder so I don’t think it’ll work here. Sorry! I just made these and WOW. Most of the batter didnt even make it to the truffle stage…… 😉 Thank you for your genius recipes! I don’t know why but mine turned out goopy (like a REALLY thick pudding). What I mean is that it’s overly sticky and can be rounded into a ball, but it then it can’t be picked up as it semi droops out of my hand. Any ideas on how to fix this? Oh no! Did you make any ingredient substitutions, like whey protein in place for the brown rice protein? That’s the only reason I could think of as to why it didn’t firm up. 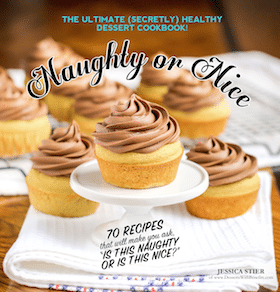 This looks like a great healthy alternative to my favorite holiday treat! What sugar would be best to substitude for the stevia? Could a liquid sweetner like honey be substituted or would that mess up the consistancy? I just made these and could not stop eating the “batter”. I just read through the above comments and now see why mine stayed rather soft. I used whey protein. So I just ordered the brown rice protein powder and will try again. I dipped them in hemp seeds and will eat them anyway. I just had a great idea though, the soft “batter” would be GREAT for icing on the carbquik brownies! I used vanilla Stevia and just a little vanilla paste to keep the sugar lower. Super delicious! Thank you so much for the recipe! Off to make brownies now! I have an Intolerance to rice. Can another protein powder be used here? I have a soy based protein powder….Any suggestions? 22g of fat divided by 15 truffles = 1.47g fat. 1 serving is 2 truffles, so 1.47 x 2 = 2.94g fat. Thanks. I missed where it said it makes 15. Hey! These look beyond amazing. Question: any way I can use almond milk instead of the condensed milk? That might be too thin…maybe plain ol’ canned coconut milk would work? Any chance regular ol’ coconut milk (or almond milk) would work instead of the condensed milk? I realize it’s less thick…but maybe by adding only 3/4 cup or 1 cup of liquid? LOVE how these look and cannot wait to make them. I’m sure full fat coconut milk would work here, but then you’d also need to compensate for the missing sweetness and vanilla flavor that is in the condensed milk recipe. High protein truffles that are macro-friendly?! Sign me up, girl! These look so delectable and perfect! These look really awesome 🙂 I never thought about adding protein powder to truffles, that’s really clever! Wow, I’m impressed! This is chocolate fudge in the truest sense. This looks and sounds delish and love that there’s no sugar. Really a must try!